There is a new maior in town called Pompous and he wants to clean the streets of all the bad guys out there that are still doing illegal activities. Joe Destructo got a surprise visit from the maiors best trained cops and he wants him to do his dirty work for him. Joe is not happy about it but he needs to clear his rep and pay his debts that he got from a few gambling projects. 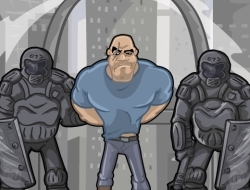 The maior promised to clear out his name and pay the money himself if Joe manages to clear the streets of every bad guy out there so the city will be a better place for all. You must head out on the streets and clear them of any thug you can find. Try to get as many achievements as you can and collect the weapons the thugs leave behind and use them yourself. Use the arrow keys to move Joe, the mouse to aim and fire, scroll / the number keys to change weapons. Joe Destructo 0.00 between 0 and 10 based on 0 votes.